One of the three dogs that were seized over the weekend. 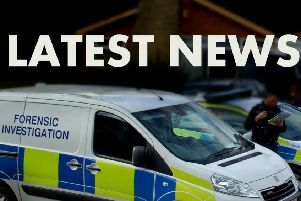 Three people have been arrested near Louth during the first weekend of Lincolnshire Police’s Operation Galileo enforcement campaign. Two men and a 17 year old male youth, from County Durham, were arrested following an allegation of hare coursing near North Cockerington, Louth. In addition, three dogs were seized and a Nissan Almera was also seized. The three men have since been bailed for further enquiries. In total, there were 27 incidents of hare coursing reported over the weekend, spread across the rural areas of Spalding, The Deepings, Sleaford, Boston and the Wolds. Chief Inspector Jim Tyner, force lead for rural crime, said: ‘We have to balance our response to reports of hare coursing with other competing demands. Unfortunately this means we are not able to resource every incident when officers are committed elsewhere. “Whilst I understand the frustration of rural communities when we can’t respond I want people to be reassured that we are committed to reducing hare coursing. “Our seizure of dogs demonstrates this commitment as this is believed to be a significant deterrent. “The message from me is simple: if you are caught hare coursing in Lincolnshire we WILL seize your dogs, seize your vehicles and see you in court’. • Mr Tyner confirmed via Twitter that the seized dogs would be cared for in kennels while the police apply to the courts for forfeiture and re-homing.